The credit crunch continues to ripple out across the global financial sector with banks outside of the US just as badly hit as those within the US. Today's turn is the French Bank Natixis (Frances fourth largest bank) which declared that it has been hit hard by its exposure to the US subprime mortgage market. Making bad debt provisions of $600 million against its CDO portfolio in its third quarter results. The banks parent companies aim to bail out it out by taking over the CIFG bond insurance unit and injecting some $1.5 billions of funds to ensure the business was able to continue. The bank reported a profit increase of 16%, though this included the sale of its paris headquarters, excluding this profits down some 40%. The Natixis share price is down some 40% this year with further falls expected today. The complex nature of the packaged debt means that many more blowups are expected, especially as the linkages between the holders of the debt and the assets have become diluted, making it difficult for the debt holders to claim assets in the case of defaults. A further two million US homeowners are at risk of foreclosure during 2008, as their mortgages reset to much higher interest rates despite the cuts in the US Interest rates. As the liquidity squeeze has resulted in risk aversion amongst lenders who now demand much tighter lending criteria. The US government is attempting to halt the slide into a Housing depression by urging lenders to negotiate rather than to foreclose. The problem here is that the mortgage has been sliced and diced and packaged off into multiple chunks so exactly who negotiates with who ? This effect of this is to make the process of foreclosure pretty much automatic and hence why the CDO market has become near impossible to price. 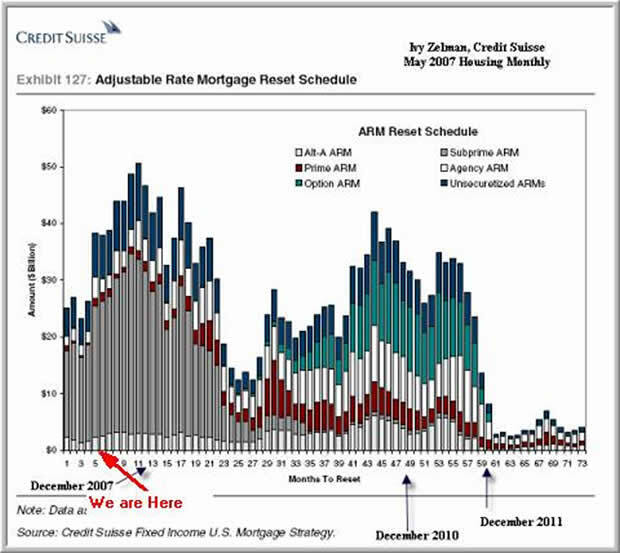 The Peak in Arm resets for subprime mortgages is expected to occur in January 2008 and remain high into September 2008. Therefore the next 9 to 12 months is expected to continue to result in a surge of foreclosures and therefore hit the both US house prices and the financial sector. Also remember that the number of resets is accumlative which means the impact of which will be felt for at least a further 12 months and therefore for much of 2009. The CDO market took a further hit last week when a judge in Ohio ruled against Deutsche Bank's attempts at trying to foreclose 14 properties in Cleveland. The Judge ruled that Deutsche Bank had no legal claims over the properties as they were not able to provide proof of ownership of the mortgages as the CDO are collateralized debt obligations which contain the right to receive a return on the mortgages but not titles towards the ownership of the properties. Whilst householders challenging foreclosure on this basis may see a benefit, the wider consequence is much greater as there would be a loss of confidence in the credit markets as the CDO's lost further value resulting in much larger losses than even the $400 billions currently estimated. The reason being that banks would be prevented from selling assets of defaulters which would lead to a much deeper credit crunch than we have so far experienced. I can see that is going to be a big problem ! Does it mean people can still live in the properties without paying the mortgage ? Appears so !